Lake Erie Fishing Charter Located In Ashtabula, Ohio. We offer daily trips for Walleye, Jumbo Perch and Steelhead. 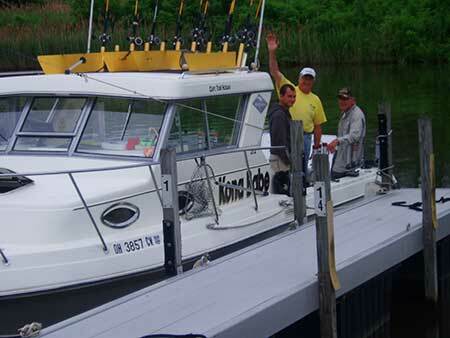 The Lake Erie Fishing Experience with Captain Tom Hogan. Kona Babe Lake Erie Fishing Charters is owned and operated by Captain Tom Hogan. We are located in the Central Basin of Lake Erie. We are docked at Kisters Marina on the Ashtabula River in Ashtabula, Ohio. Kona Babe Lake Erie Fishing Charters provide a fun and safe day of fishing on Lake Erie for Walleye, Jumbo Perch and Steelhead Trout. The experience provided allows our customers to be involved in a "hands on" fashion by setting lines and landing Monster Walleye, Jumbo Perch and Huge Steelhead Trout. Kona Babe Fishing Charters operates in full support of the Zero Tolerance program of the U.S. Coast Guard and U.S. Customs Service. No Drugs of any quantity are permitted on Board. Dates Fill Up Fast! Give us a call or send an email to reserve a day on Lake Erie with Kona Babe Lake Erie Fishing Charters.